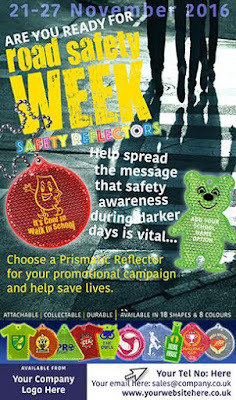 At the beginning of this month BPMA released an article discussing the up and coming road safty awareness week in November; offering people, in particular children, a selection of reflective branded products that can be attached to bags and coats to make the user more visible. Promotes the brand - This can be either through the day or during the night as it both reflects and has a bright colour scheme that attracts attention no matter the weather or visibility. Protects the user during the night and in the winter months - Providing not only a promotional service but potentially saves lives by making the user more visible to traffic on their way to and from school or work. Within schools road safety lessons and cycle proficiency tests are essential, usually being the first contact of promotional safety reflectors. Like many free gifts and potential collectibles, children and teenagers will love it - trading and comparing the colours and shapes to their friends, maximizing brand exposure. One great advantage of this promotional gift is that it provides companies with the choice of almost any shape and colour to suit their brand and what they are selling. For example if they are a football company it gives them the potential to sell t-shirt or football reflectors. Finally for the older generation more adult related reflectors can also be sold showing that it can target all age markets. With these type of products, such things as beer branding and adult humored logos can be printed to interest older customers. Save a life as well as promote your brand this year through branded safety reflectors, a fantastic idea shown to us by BPMA. If you are interested more in BPMA: 2016 Road Safety Initiatives please follow the attached link. BPMA is the recognised authority and voice of the promotional merchandise industry and represents over 600 members in the UK. Their actions advocate best practice and inspire confidence amongst members and buyers. To find out more please follow the link to the BPMA contact page.